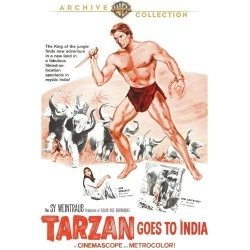 John Guillermin (Tarzan's Greatest Adventure ) directs this tale of action and intrigue in the subcontinent. Tarzan (Jock Mahoney) is summoned to come to the aid of a parade of pachyderms endangered by the development of a dam. Sy Weintraub continues his slate of sophisticated Tarzan adventures that frames the action with a frank look at the costs - and the need - for progress in the developing world and greater environmental protection. Aided by Jai the Elephant Boy and the mighty elephant Gajandrah, Tarzan's quest to save animal and flood refugee alike swings it way onto Blu-ray Disc looking as verdant and virile as ever.